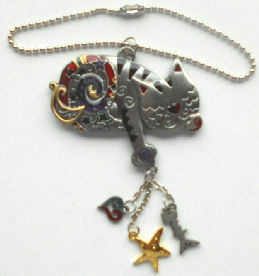 Here is a smiling pewter cat decorated with stars and moons in detail enameling. The cat is 2 1/8" wide x 1 1/2" high. Hanging from the cat's paw is a star, a heart and a fish skeleton. Shown here with a chain attached at the top but you can use it as a pendant or a key chain. Previously owned but in good condition.